Justin (not his real name), came to see me with issues of panic attacks, obsessive thoughts, and the start of learning issues. He had started at a top university and found that he lacked focus. He had had this problem before but was finding that he was starting to be unable to focus. A psychiatrist had given him Paxil to help calm him down but that made the problem worse. Justin came to see me for neurofeedback. In doing the intake, I learned that he lacked seasonal allergies and had severe sleep issues. He found that if he took an anti-histamine for any reason he would become extremely agitated. Blood testing showed that Justin was overmethylated and methylated folate was key to treatment. Overmethylation leads to a problem in the body called histapenia meaning too little histamine. It is one of the subtypes described by William Walsh in the Walsh Protocol. While similarities exist for the same diagnosis, overmethylation has peculiar traits. Patients with histpenia have a different presentation. They may be depressed, anxious, or unable to concentrate. You might be wondering, how is this different? The quality to the depression, anxiety, or ADD is different in overmethylated people. Only 8% of the total population present overmethylated. But over 2/3s of Americans with a mental or behavior health problem have methylation problems. Depression, anxiety, schizophrenia, ADD, and behavior problems arise from overmethylation or undermethylation. In another article, I discussed undermethylation. In this one, I want to explore the traits, qualities, and treatment of overmethylation. Before jumping into overmethylation and its treatment let’s review methylation as a whole. Methylation is a process that allows for cells to turn DNA on and off. DNA is a complex molecule that needs to unwind to be used. There is a huge amount of DNA relative to the size of a cell nucleus. If you stretched it out from end-to-end it would be around 3 meters in length. That’s a lot of DNA to fit inside the nucleus, about 6 micrometers in diameter on average. That’s a decimal point followed by 6 zeros and then a 6 meters. How does the cell get something that is 3 meters in length inside of something that is .0000006 meters in diameter? Carefully to be sure. The DNA wraps itself around proteins called histones. It becomes small balls of thread that must be unwrapped for use. If the cell does the same thing over and over again, it needs to bookmark the place that it frequently uses. Methylation is one of the methods that cells bookmark DNA sections. There’s a curious feature about this bookmarking. For many years, scientists believed that our DNA dictated every trait and feature. The human genome project existed to map the entire sequence of human DNA. It was expected that over 100,000 genes would be found in the human genome. The assumption was that there are specific sections of DNA that code for specific functions. But there were less than 24,000 found. It turns out that there is something called epigenetics that explains this. Methylation plays part of this role too. Epigenetics is the science of understanding why genes turn on and off as they do. Cells use DNA adaptively. Genes turn on when the situation calls for it. Experiences shape what genes are more likely to be used. If the cell has a learned behavior it is more likely to want to reuse that gene in the future. Methylation is one of the ways that the DNA gets coded to be used or not used. The tagging locations are often passed from generation to generation. What you eat, breathe, think, and experience changes how your DNA turns on and off. Moreover, what your parents and grandparents ate, breathed, thought, and experienced is affecting your DNA today. This is why so many traits appear to be both learned and “genetic”. The learned traits are encoded into the DNA through epigenetics. How Do I Know I’m Overmethylated? Methylation is only one tag that is used by DNA. It happens to be one that we can measure. And it is likely that it can be manipulated through supplementation and diet. Measurement is generally done indirectly through histamine. Histamine appears to move inversely to methylation. As methylation goes up histamine comes down and vice-versa. As we already discussed about undermethylation, many medications can affect histamine. This skews the test giving false positives or negatives depending upon the result. Sometimes going off of symptoms can be enough. This is tricky though as even experienced practitioners have been mistaken. 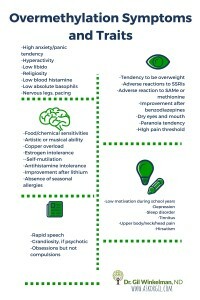 Below is a list of the symptoms that are frequently seen with overmethylation. Not all exist in the same person. If I can’t test for it then what? Sometimes diagnosis can be predicted based upon reaction to medications. Many overmethylated people will feel much worse taking an SSRI such as Paxil, Prozac, Welbutrin or other. These drugs tend to lower histamine further creating more of an imbalance. Overmethylated people often do better on benzodiazapenes such as Xanax and Ativan. I have had patients take both SSRIs and benzos and either do poorly or well on both. This is part of the reason I like to test. The key feature I look for in overmethylation is someone who has blunted emotion. They may have a high pain threshold. They often need to feel pain to feel alive. They could be thrill seekers. But the basis of this is a hyper-stimulation inside. It’s as if they have emotional tetany. Everything is so intense that it all locks up. In general, these people will need treatment their entire life. For many, the issue does stem from a single nucleotide polymorphism of the MTHFR gene. But that isn’t always predictive of overmethylation. Regardless it is easy to treat. How do I Treat Histapenia? Treatment is simple. Folate is the key. Overmethylation disorder is also called Low-Folate disorder. (It can be ADD, OCD, depression, Conduct Disorder, anxiety, schizophrenia or something else too.) Folate is an important part of the methylation cycle. The key point to remember is that folate, even methyl-folate, is a net methyl reducer. Reducing methyl is key because that will cause histamine to increase. Histamine is an important messenger and neurotransmitter in the body. We usually think of it relative to allergies but it is crucial from proper nervous system function. Folate in these individuals is generally low and so the left side of the diagram below gets slowed down. Adding folate increases the cycles. As you can see from the diagram, this is a complex process. Many things could be out of balance besides low folate such as heavy metal toxicity. Other vitamins are important to support the body. Niacinamide, Vitamin C, Vitamin B-6, and zinc are all important in helping balance methylation. Some patients find a small amount of manganese can be useful too. Anxiety may increase for 1-2 weeks after starting the regimen but then should improve. As with the other Walsh Protocol components, I highly recommend clinical supervision. A qualified professional will be able to assist if anything unexpected arises. And there are many people who have assumed that they have one condition when in fact there are multiple imbalances. While around 37% of schizophrenics are low-folate, overmethylation in the general population is rare. It is sometimes difficult to diagnose without testing. Treatment is simple if the diagnosis is correct. Most people find that they do improve with treatment. Some have other imbalances that need further treatment. If you have any of the conditions listed above, please call my office to get tested. I can help you find if there is an imbalance that can be treated.